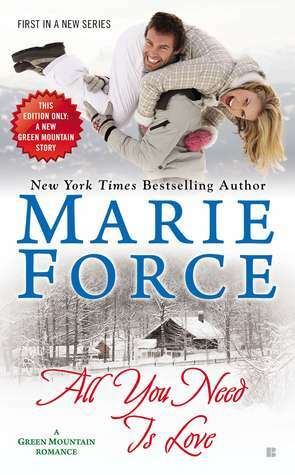 All You Need is Love is the first in Marie Force's Green Mountain series. I fell in love with it straight away because of the ..... setting! It is set in Vermont, which I know nothing about, however after a virtual trip thanks to Google, I so wanted to visit this place. Marie Force must have enjoyed her research of this place. The author speaks of the Vermont Country Store - it's real and I could visit that online too. After my virtual 'research' I settled in happily to the book and enjoyed the story and the family that runs the store in the book. Cameron, arriving at a small town in Vermont, comes off second best with the local moose - Fred. However she is rescued by Will Abbott, who while he may seem a little grumpy, actually soon falls under her spell. Will comes from a very large family, the exact opposite of Cameron who has grown up as an only child. Her mother is dead, and her rich father is rather aloof. Cameron finds that while Will's siblings initially resent her and the job she has come to do, they soon come around. Cameron finds herself enveloped by this family, and especially loves Will's dad and mum and grandfather. Cameron loves the country store the family runs, and soon has wonderful plans for the website. Her relationship with Will develops, yet they both recognise it has a limited life span. Will is a country boy and Cameron... she's a city girl. What will happen when the job is done and Cameron wants to return to New York? It's a warm, cosy, family oriented story, with a couple who are attracted to each other and know it. In such a large family - the Abbotts have many a story to tell, so I know I will be looking forward to each of them finding 'true love'. I would even love to read the story of the grandparents and parents. Readers of Robyn Carr and Jill Shalvis would love this series. I am now reading my first Robyn Carr and enjoying it more than I thought I would. I've been to Vermont several times since I used to live in New England, and it's a great getaway location. I've been to a VT country store, but not this particular one you linked above. Thanks for spotlighting a new to me author and title. Oh Rita, Marie Force is amazing! I know I am going to like this series. I eagerly anticipate her next in her Fatal series - totally addicted to that! I should have also added how wonderful to have been to Vermont, it looks stunningly beautiful, especially the autumn pictures. Hope you enjoy your first Robyn Carr - I adore her books. This sounds cute and Vermont is a place I want to visit. It's supposed to be beautiful there. Me too Naida. Very enticing.